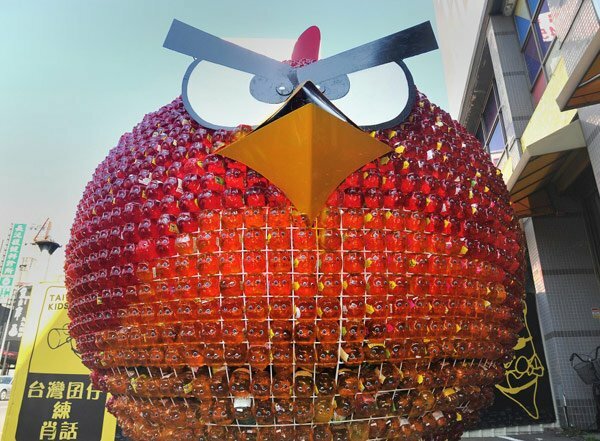 There’s no doubt in my mind that the Taiwanese love Angry Birds as much as everyone else, but check out this art installation of the red Angry Bird that was made for the Taiwanese presidential candidate Tsai Ing-wen. The installation itself features the head of the red Angry Bird. The bird is made of crimson-tinted piggy banks that have been arranged in a latticework to flesh out the bird. He must sure love playing Angry Birds if that’s the installation that’s featured outside his campaign office. I wonder what his opponents will think of next. Probably a bunch of green piggies made from cans, or something along those lines.